Haq's Musings: H1B Visa Abuse: What Do Software Engineers Earn in India and Pakistan? H1B Visa Abuse: What Do Software Engineers Earn in India and Pakistan? A segment of CBS 60 Minutes, top rated American newsmagazine on television, has recently brought sharp focus on H1B visa abuse. It alleges that the H1B visas are being misused by Indian body shops to bring low-cost Indian software engineers to the United States to replace higher-paid American workers. The visa category was originally intended to help fill gaps in the high-tech workforce with highly skilled employees from abroad in situations where there aren’t enough Americans. Instead, it has given rise to body shops that bring in workers from overseas, mainly from India, to replace higher-paid American workers. Recent examples of the firing of American IT workers and their replacement by Indian workers at UC San Francisco and Walt Disney and Co have received a lot of media attention. What has particularly incensed the American public is the practice of forcing the American workers to train their replacements. A loophole in H-1B legislation that US companies are taking advantage of allows them to outsource jobs to Indian body shops without even looking for Americans, if those jobs pay approximately $60,000 or higher. Similar jobs in Silicon Valley pay an average of $110,000 a year. The average salary of a software engineer ($110,000) in Silicon Valley is about 20X more than the average salaries in India ($6,875) and Pakistan ($4,770), according to Glassdoor. Indian body shops are masters of gaming the H1-B system. Most of India's IT exports to the United States are made up of wages of H1B workers brought to the United States by a handful of Indian body shops like Cognizant, Tata Consulting Services (TCS) and Infosys. In 2014, 86% of the H1B visas for tech workers were granted to Indians, according to available data. Excluding the Indian H1B workers' pay, India's IT exports drop to about one-twentieth of the the amount reported by the Indian government as IT exports, according to a 2005 study by US General Accounting Office (GAO). Along with cracking down on illegal immigration, a key campaign promise of President Trump has been to create lots of American jobs for American workers. “You’ve heard me say the words, and I’ll repeat them, right now: Buy American and Hire American. It’s not just a motto, it’s a pledge. It’s a pledge to the working people of this country. The era of economic surrender for the United States is over -- it's over,” Trump said at Michigan earlier this week. Right after the CBS 60 Minutes segment on H1-B visa, Senator Chuck Grassley tweeted: "If u just saw CBS 60minutes abt ripoff H1B visa program is replacing AmWorkers u shld know my/Durbin bill will correct this injustice." There are reports that new legislation is being offered to change the H1-B program. Among the key provisions of this new proposed legislation are cutting the number of visa by 50% and doubling the minimum salary of H1B workers from $60,000 to $120,000. The abuse of H1B visas to replace American workers and depress wages is drawing both legislative and executive attention under the Trump administration. High profile cases like the firing of American workers at UC San Francisco and Disney and their replacement by Indian workers has energized the support for cracking down on abuse. Riaz Bhai, i fail to understand what these figures mean. I will give you a simple comparision. India's IT industry is approximately 147 Billion USD in 2015. About 60% of Pakistan's Nominal GDP. Comparatively Pakistan has about 2.8 Billion USD in 2016. 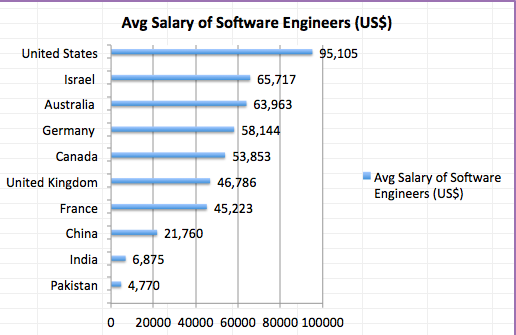 The salaries mentioned for Indian software , is it the starting salary? I was always wondering what exactly Indian IT industry was exporting, to make the industry India's biggest exporter. I have never heard of any Indian software, nor had I used any Indian Apps like I use Wechat，Clean Master or Antutu from China on my smartphones. 19640909rk: "India's IT industry is approximately 147 Billion USD in 2015"
Almost all of it is services revenue and exports are essentially H1B workers salaries. US cracking down on H1B will have massive negative impact on Indian companies revenues and exports. 19640909rk: "The salaries mentioned for Indian software , is it the starting salary?" These are national average salaries reported by Glassdoor. Can someone explain how India really earns from h1b visas ? With someone claiming that 90 % of our earnings dependent on it . 85000 h1b visas per year. Indians get 80 % . earning per person usd 60000.
ie 60000 × 68000 = 4080000000 = 4.08 billion usd. For a 3 yr period , assuming 100 % stay back in the US = 4.08 x 3 = 12.24 billion usd. How does this translate to 90 % of 100 billion $ , which are Indias export ? Kumar: "Can someone explain how India really earns from h1b visas ? With someone claiming that 90 % of our earnings dependent on it ." In theory, India follows what is known as BPM 6 (MSITS) reporting method for software and information-enabled technology services (ITES) which counts sales to all multinationals, earning of overseas offices, salaries of non-immigrant overseas workers as India's exports. In practice, India violates it. BPM 6 allows the salaries of first year of migrant workers to be included in a country's service exports. India continuously and cumulatively adds all the earnings of its migrants to US in its software exports. If 50,000 Indians migrate on H1B visas each year, and they each earn $60,000 a year, that's a $3 billion addition to their exports each year. Cumulatively over 10 years, this would be $30 billion in exports year after year and growing. This is just to the US. Indian forms also send workers to other western nations whose earnings are included in Indian IT exports. First, what is wrong? American companies are saving money, Indian people are getting access to middle class lifestyle. If Americans want to take up these jobs, why not work for less money, why are they insisting on charging a job. Second, why cant Bakiland get its share of the H1B pie. As you say, the quality of education is much better in Bakiland. Majumdar: "First, what is wrong? American companies are saving money, Indian people are getting access to middle class lifestyle. If Americans want to take up these jobs, why not work for less money, why are they insisting on charging a job." $60K is less than a living wage for places like Silicon Valley and San Francisco. Indian H1B workers are mostly singles living in spartan conditions in overcrowded housing. Majumdar: " Second, why cant Bakiland get its share of the H1B pie. As you say, the quality of education is much better in Bakiland." For the same reason that other countries like China don't. This market is dominated by a few Indian body shops that have mastered the H1B game. They take away more than 85% of the visas each year. SAN FRANCISCO (AP) — The owner of a company that supplied foreign workers to San Francisco Bay Area technology companies is facing visa fraud charges after filing fake documents to bring people to the United States, the U.S Attorney's Office announced Friday. A federal grand jury indicted Jayavel Murugan, CEO of Dynasoft Synergy, Inc., and a second man, Syed Nawaz, on Thursday on charges including conspiracy to commit visa fraud. The men obtained H-1B visas for more than a dozen people by claiming the workers had jobs at Stanford University, Cisco Systems and Brocade Communications Systems, according to the indictment. No such jobs existed, but Dynasoft could use the fraudulently obtained H1B visas to get the workers to the U.S., where it could place them with other companies and profit, prosecutors said. Bala Murali, Dynasoft's chief operating officer, said Nawaz was not available. Murugan said he did not know about the indictment and was "shocked." He said he needed to consult with his attorney and did not immediately have additional comment. India does not count H1B salaries as exports. It's just false. Raj: "India does not count H1B salaries as exports. It's just false." India counts the earnings of temporary Indian workers residing in the United States as exports to the United States. However, the United States only includes temporary foreign workers who have been in the United States less than 1 year and who are not on the payrolls of firms in the United States. Indian officials estimate that this factor may account for 40 to 50 percent of the difference between U.S. and Indian data. India treats sales to U.S.-owned firms located outside of the United States as exports to the United States, but the United States does not count these as imports. 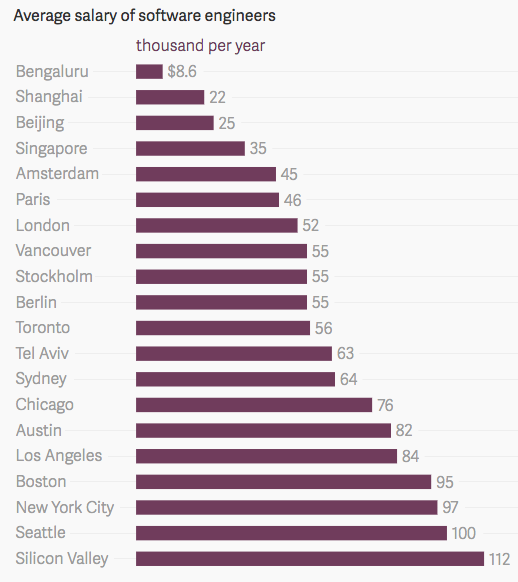 (For example, salaries of Indian workers working at US-owed companies abroad). this is a 12 yr old document. In case you were sleeping since 2005, all top Indian companies are now listed in US stock exchanges. Counting salaries as exports will certainly lead them to jail time. We understand porkis have massive inferiority complex as in the 70s yrs they have not risen above export of towels and even there they are getting screwed by China, Bangladesh. Sri K: "this is a 12 yr old document"
The Indian government's practice to include H1B workers' pay in its IT exports has not changed since 2005. As a result, the percentage of Indian IT export revenue now depends much more heavily (closer to 80-90%) on H1B workers' wages now than 40-50% it did in 2005, given the tremendous increase in the total cumulative stock of Indian H1B workers in the US and elsewhere. Indian companies and workers are disproportionately gaining from the current method of allocation of H-1B visas and this is a distortion of the programme, said a U.S lawmaker at the forefront of an ongoing campaign against alleged abuse of the visa programme. The current system of selecting H-1B visa recipients is neither fair nor efficient, and it must be replaced, said Congressman Darrell Issa, who has recently introduced a Bill that proposes to raise the minimum salary of H-1B employees to $1,00,000 per year from the current level of $60,000. “We can’t have 75% of a programme going to Indian-owned, Indian-operated companies and Indian employees and not say that this is a distortion. At the end of these reforms, will this programme still disproportionately favour countries that are willing to let go of their high-skilled workers and come here? Yes. Will it be as extreme as it is now? No,” the lawmaker said. The Congressman had proposed to expand the number of visas in a Bill in 2013, but he said that proposal is not desirable now. “We were then saying that we are pushing to get the best and the brightest to the country. We had a lot of good people going away even after graduating from U.S. universities, including the medical doctors,” he said adding that due to the abuse of the programme, American people have lost confidence in it. Your argument will only make economic sense if the dollars tally up. However, they don't. India's forex reserves are climbing approximately $5-10 billion per year for some years now and approaching 400 billion. FDI and other dollar expenditures to show if you're right. I think not. CK: "Please use foreign trade figures, remittances FDI and other dollar expenditures to show if you're right. I think not"
Yes, India's big trade deficits are more than offset by FDI inflows. It makes India heavily dependent on foreign investments to avoid balance-of-payment crisis. The Donald Trump administration’s crackdown on work visas is hitting Indians disproportionately hard. Between July and September 2017, the US denied H-1B visas to 23.6% of Indian applicants, up from 16.6% in the three preceding months, according to the latest data (pdf) released by the National Foundation for American Policy (NFAP), a non-profit, non-partisan organisation dedicated to public policy research. Besides the uptick in outright denials, there has also been a sharp increase in the number of requests for evidence (RFE). These are notices the US authorities issue to visa applicants seeking more information on their applications. Between July and September 2017, the Trump administration issued 63,184 RFEs, compared to 63,599 RFEs issued during the nine months prior. Several lawyers previously told Quartz that their clients were struggling with the high number of RFEs, which not only delay the visa process but also increase costs for companies. Here, too, Indians took a severe beating. Between July and September 2017, up to 72% of Indians applying for H-1B visas received RFEs, compared to 61% for all other countries. Between October and December 2016, during which period president Barack Obama was in office, only 18.2% of Indian applicants were asked to submit supplementary material. Hardware & networking jobs fetch about Rs 15 lakh per annum ($21,500) .. software jobs fetch about Rs 12 lakh ($16,900) , and consumer jobs Rs 9 lakh ($12,700).